An observation bell with one occupant was lowered 20 fathoms to the bottom of the sea during a treasure hunt 100 miles off the Northern coast of Haiti. As the bell reached bottom, a giant 24-ft. octopus was seen crawling along a cleft in the coral reef. Disturbed by the appearance of the invader, the creature rose on its 8 legs and made straight for the bell. The observer inside the steel tank was stunned as the octopus shook the bell in a death gripâ€”its arms completely encircling the tank. 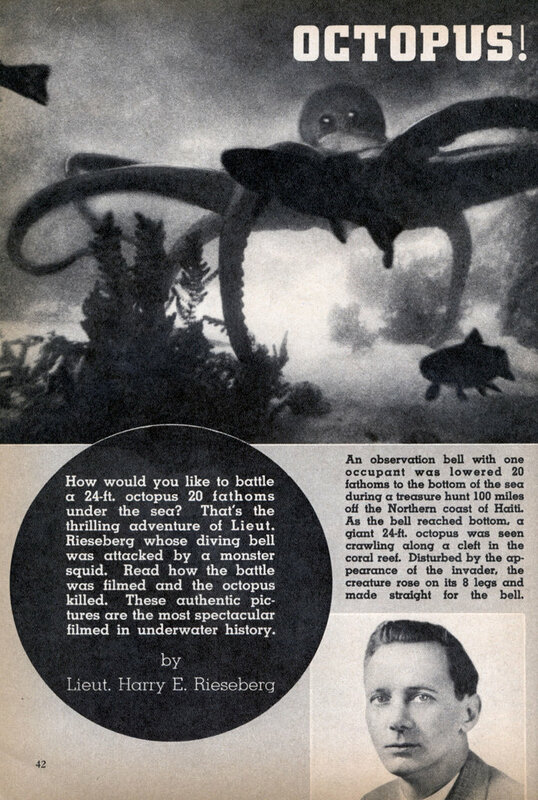 With the octopus thus engaged, Lieut Rieseberg maneuvered his robot diving tank (above) until octopus was within range of mechanical arms of the robot which caught and cut two arms of the monster squid. The gray-repulsive mass with its 10-ft. long snaky arms flayed the water as it swam to meet the invader in its lair. The octopus loomed like a gigantic tarantula, circled like a boxer, crouched on its 8 arms … and lunged at the bell. It struck with terrific force! Slowly dying after two tentacles had been severed by steel claws of the robot the octopus writhed and spewed its defense fluid to make the water inky black. It still clung to the observation bell in a last effort to crush it, but its arms were now weak and useless. After the inky defense fluid had cleared somewhat, Lieut. 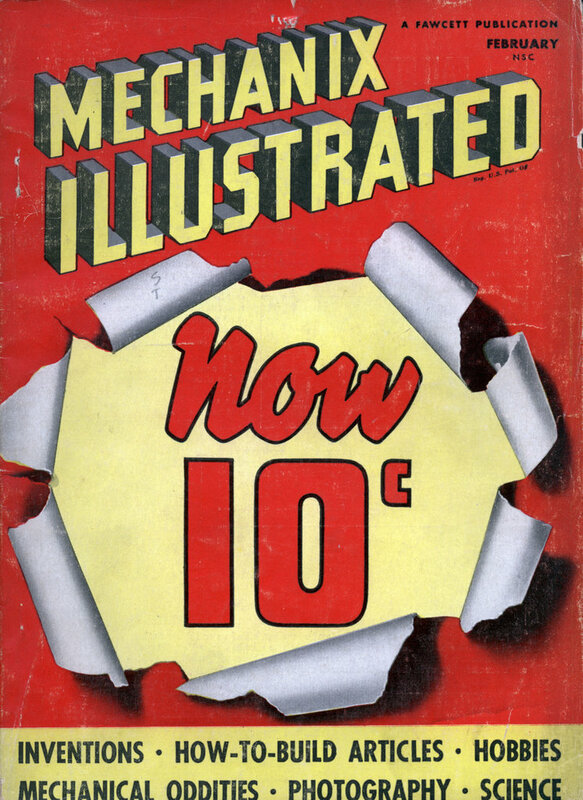 Rieseberg, who had been taking photographs of the attack from the interior of the robot now rose to the surface, donned a diving suit, and with an acetylene torch for protection, walked between the huge lifeless tentacles of this terror of the deep whose arms are studded with suction cups of 19 lbs. force. Bubbles swirled upward as the sea-dragon died. What a shame, to kill such an interesting creature…it was probably curious, and couldn’t have harmed the bell or its passengers.